"How can I add pages into a PDF?" You might be involved in such case that need to insert pages to PDF file or combine multiple PDF pages into one PDF file, so that you can send it to the receiver for conveniently reading. This article will tell you how to add pages to PDF with PDFelement ProPDFelement Pro in an easy way. Have a look. PDFelement Pro (including macOS 10.14 Mojave) or PDFelement Pro for Windows is the best PDF Editor to add pages to PDF. This professional PDF editor comes with multiple PDF editing tools which allows you to edit PDF pages with ease. So, how can you insert pages to a PDF file using this editor? The following are the simple steps on how to add a page to a PDF file on a Mac OS X, including the newest Mac OS X 10.14 Mojave. Launch the PDF editor and then click the "Open File" button to go to the destination where necessary PDF file is stored. File opens automatically. You can also open file from the File tab. Method 1. Use the Insert Pages Feature: In first method, insert a blank page or multiple pages from another PDF. Just go to the "Edit" tab and click "Insert Pages". Select the pages or document you want to add. The added pages will appear instantly. Method 2. Use the Merge Document Feature: To do so, open the file merger by clicking on the "Combine PDF" button. You can then click on the "Add Files" button at the upper left corner. Also, you can access the function by clicking on the Merge button on the toolbar. When PDF files is added, you can just adjust the order as you want, as well as choose the pages that you want to add. Lastly, click on the "Combine" button to confirm and start merging PDF pages. Edit, delete, etract, copy and change texts in PDF files. Add, delete, crop, rotate and etract PDF pages. Provide powerful PDF editing tools to edit images and links in PDF. Easily mark up PDF files and leave comments to PDF files. Convert PDF to Word, Excel, PPT, images and other formats. 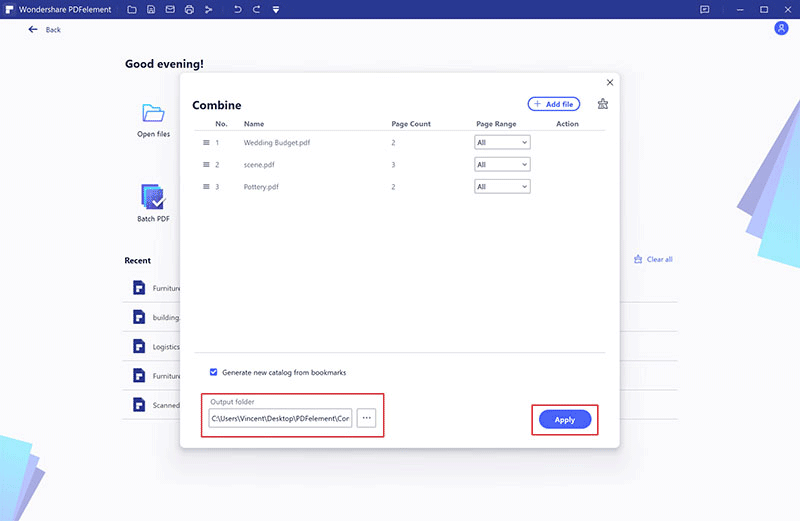 Intelligent PDF form feature to fill out and create PDF forms. Secure PDF with watermark, signature and passwords. Advanced OCR feature to edit and convert scanned PDF. To add pages to PDF or combine PDF files on Windows can be very simple with the help of PDFelement Pro for Windows. This tool comes with the options for you to create pages or import from the existing files. Also, you are able to arrange the pages in the order you want. Just take below simple steps to add pages to PDF file on your Windows PC. When you have installed the PDF Editor on your Windows PC, launch the program. Then click the "Open" tab to import your original PDF file to the editor. Alternatively, you can directly drag and drop the PDF file from your local folder to the program, and the file will open automatically. Method 1. Insert Pages to PDF Document: Now, go to the "Page" tab and click the "Insert" button to select the PDF pages you need. Two options are offered: insert a blank page and insert pages from local computer. You will find the newly added pages in your current document as soon as it's done. Method 2. 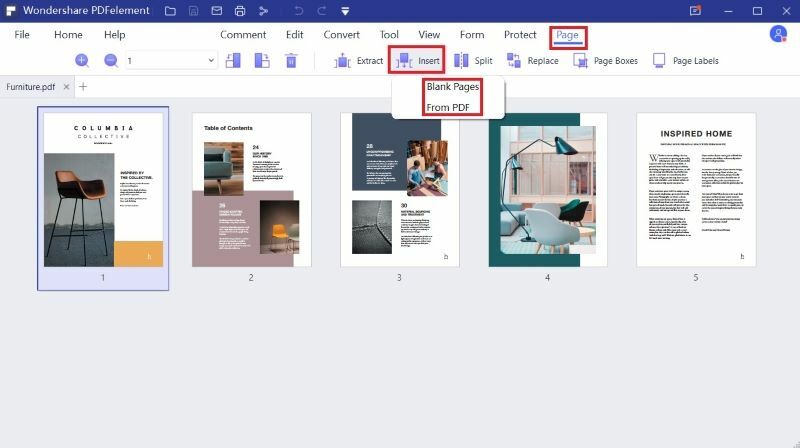 Combine New PDF Pages into Original File: You can also use the Merge function of this Windows editor to combine multiple PDF files. In the main interface, click the "Combine PDF" tab, a pop-up window will appear. Just click the "Add Files" to import the PDF files and merge them into a single PDF document.